Since ancient times, one of the traditional methods for quieting the mind has been through prāṇayama, the practice of regulating the flow of prāṇa, the vital energy, by focusing on the natural rhythm of our breath. When we focus our attention on the steady flow of the breath, the mind becomes relaxed and quiet. A quiet mind is simultaneously receptive and alert and easily glides into the inner space of the Self. Once the mind rests in the stillness of the Self, you can assimilate Gurumayi’s Message more fully. To begin this session, I will lead you in establishing a steady and comfortable posture. A steady posture is the foundation for experiencing the natural movement of the breath, and it creates an inner spaciousness that encourages the breath to move freely and naturally. Click play to practice assimilation through breath. ©2016 SYDA Foundation®. All rights reserved. 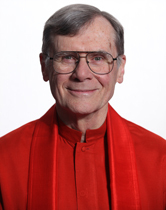 Swami Anantananda has been following the Siddha Yoga path for nearly forty years. In 1980, he took vows of monkhood to become a Siddha Yoga Swami. Swami ji serves Gurumayi as a Siddha Yoga meditation teacher; he has taught in numerous Siddha Yoga Sadhana Retreats and Shaktipat Intensives, and he is the teacher for the Siddha Yoga home study course The Power of Recognition: Kundalini Shakti. Swami ji also offers seva in the Live Events Department of the SYDA Foundation, as a coach for speakers. Swami ji is known for his ability to teach about the mind in an accessible manner. He is the author of What’s on My Mind? Becoming Inspired with New Perception—a book which guides readers in understanding, and shifting, the relationship they have with their mind. I love these assimilation exercises. Today I did all of them, ending with Assimilation through Breath. Towards the end of the exercise, I felt my chest expand even more with my breath. I also began to experience warmth and a light energy in the center of my chest. Now as I go through my day, I notice that I am breathing more fully and deeply. This creates a sense of opening, nourishment, and increased awareness in my actions. As I breathed in and out naturally, I experienced a delicate tenderness in my heart—for my Guru, for myself, for all people. I was experiencing joy flowing gently and freely. I thought to myself, “I’m simply sitting here in this chair having the best time.” And this feeling is portable. I can take it with me anywhere. How lucky am I! I continued to meditate after Swami ji's instructions and, as I did so, I experienced the breath as an even flow that gently brought me into my own heart. There I felt the gentle throb of stillness and deep joy. I am so glad that I put time aside in my busy day yesterday to participate in this Assimilation Exercise! I felt my innermost being awaken brightly with each inhalation, and with the exhalation I felt the energy of Gurumayi’s Message throughout my whole body. At first I experienced some challenges with my breathing, but as I found my way into the practice I became completely absorbed in the Message. When I engaged with this practice again this morning, it was no longer challenging at all! My breath and the Message had become one smooth, seamless flow. Thank you, Gurumayi, for your Message and your grace! While I was in meditation, I felt the abundance of grace in my life. I feel so fortunate to receive guidance such as this. Just in an instant, I can melt into the center of my being and experience completion, happiness, and the perfection in everything. I'm appreciating how these exercises offer a way to contemplate Gurumayi's Message and make them part of me, subtly and experientially, bypassing my mind's chatter. After participating in Swami ji's Assimilation through Breath exercise a second time, I decided to close my laptop and meditate longer. I was amazed to find myself going deeper and deeper, until I began to feel shakti all around me—vivid, present, and alive. I felt as though I was sitting alone in the dimly lit blue of Shakti Nilaya Hall in the Siddha Yoga Ashram in Oakland, as I have so many times—the intense, palpable, and undeniable presence of our beloved Kundalini Shakti moving and breathing me. This experience has brought forth deep longing within me, to go deeper and commune with Her more. After Swami ji instructed us to repeat Gurumayi’s Message with the breath, I went into a very deep state. It seemed that my breath stopped; everything disappeared and I experienced myself dissolving into shimmering blue light, scintillating and dancing everywhere. An hour later I came out of this state, but I’ve been carrying the joy with me. I feel happier in my work, and I feel very light as I go to my college classes. In doing this exercise with the breath to assimilate Gurumayi's Message, in a very short time I connected with a stillness and peacefulness inside. I loved the suggestion that we can do this at any time throughout the day as a way to assimilate the Message and let it permeate our being. I’m grateful for the opportunity to assimilate Gurumayi's Message for 2016 with the support of the breath. This was an excellent way for me to effectively make space to assimilate the teaching. I felt the timeless stillness rise up within me and the calm and happy feelings of love. I love that the Siddha Yoga teachings keep flowing into my home. In the early morning, I open my laptop, and with a few keystrokes I return to the shakti of Shree Muktananda Ashram. This morning, I felt pulled into stillness as I listened to Swami Anantananda’s audio guidance on “Assimilation through Breath.” What a gem of a fresh teaching! I had a direct experience of breathing Gurumayi’s Message for 2016 in. By engaging with the Guru’s words via the breath, I was able to dip below the noise of my mind and journey to a place of precious stillness. I’m grateful for this novel way to engage with the Guru’s teachings. I feel as if I now have a portable way to pause in the midst of my day, take a slow deep breath, and allow the Guru's words to guide me to a place of inner calm and stillness. When I was listening to this audio, I felt so connected to Gurumayi ji and to Gurumayi's Message for 2016: Move with steadfastness toward becoming anchored in Supreme Joy. I felt this Message in every single breath of mine. I repeated it over and over. Thank you, Gurumayi ji, from the bottom of my heart for the wonderful Message. As I did the exercise on the breath this morning, my awareness shifted slightly from my breath to feeling my heartbeat. I heard inside me, "So much love, so much love." I feel very blessed, peaceful, and happy.